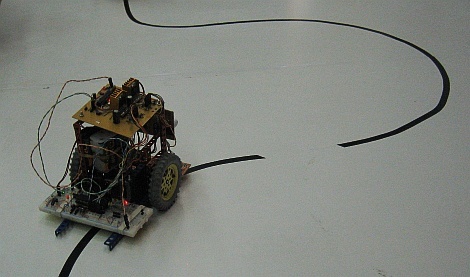 The robot's task is not to find the right way, just to follow the navigation line. 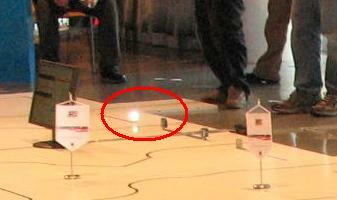 The robot starts within the starting area, which is 30 cm before the start line (infrared beam of the time measuring device). 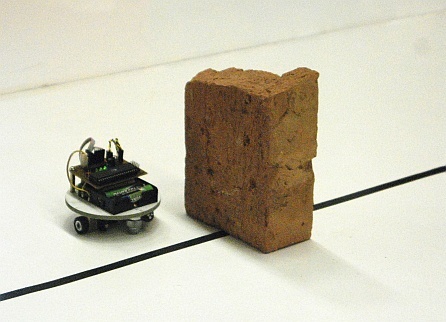 When the beam is interrupted by any part of the robot, the time starts to be measured. The path may contain various obstacles in various order. There is no guarancy that all of them will be present. Some of them may be presented more than once. P1: There can be a tunnel in the path (of minimal dimension 20 x 20 cm). P3: There can be a reflector shining on the path. 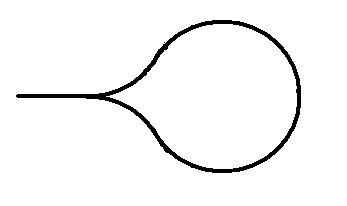 P4: The line can be forked on certain place, whereas the length of the both segments is not necessarly the same. 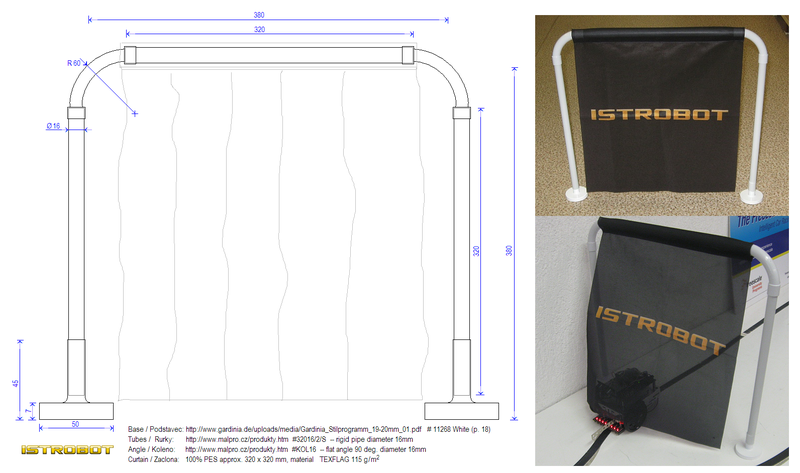 P6: Anywhere can be placed the obstacle brick. This obstacle used to be avoided. The robot has to return to the black line max. 30 cm after the brick. 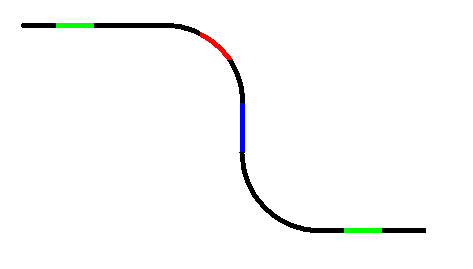 P7: On any place, the track can change its color to the red, blue or green one. Length of the colour segment will be not longer than 15 cm. P8: There can be a curtain type obstacle on the track. It is possible to drive through it or avoid it to continue the tour. P9: On any place, there can occur an "oil spoil" on the track. Moreover, the track can change its direction under the spoil. 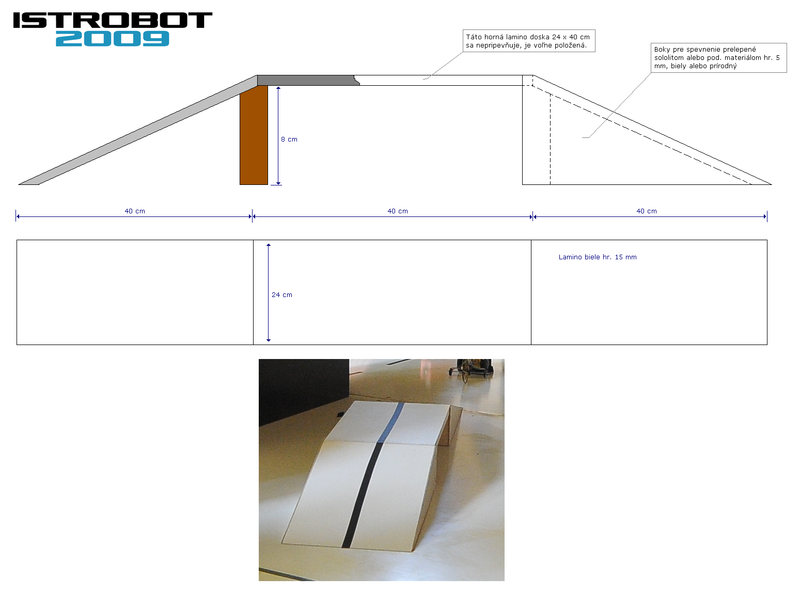 P10: At the end of the track there will be a return loop to return the robot back to the track in reverse direction. 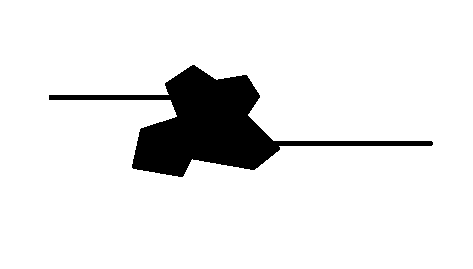 Order of the competitors is based on the results of homologization. During the homologization robot has to show its ability to drive the track with three simple obstacles P1, P2 and P3 (tunnel, reflector and interruption). The competitors must be prepared to the start within 1 minute after the call. Every robot has total 3 runs to compete. But if the competitor does not present within 1 minute after the call, the run is lost. The time between the runs can be used for fixing and adjusting the robot. In the case of too many competitors, the jury can decrease the number of runs, or it can proclaim a qualifying round. In the 2017 the levels are canceled, each robot compete in the same competition. On the other hand, there is a compulsory homologization added. Each robot, after the succesfull homologization obtains a small price. The robot has to travel all the track, turn at the end and safely return home. The winner is the robot with the shortest time from any of the three runs. Unfinished run will not be evaluated. 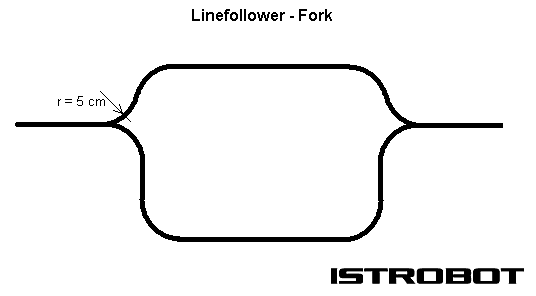 "travel all the track, turn at the end and safely return home" - this applies also on fork (P4) - has the robot use the same fork?